The CellarPro Mini-Split 3000S Wine Cellar Refrigeration System by CellarPRo is designed for Wine Cellars up to 600 Cu. Ft. 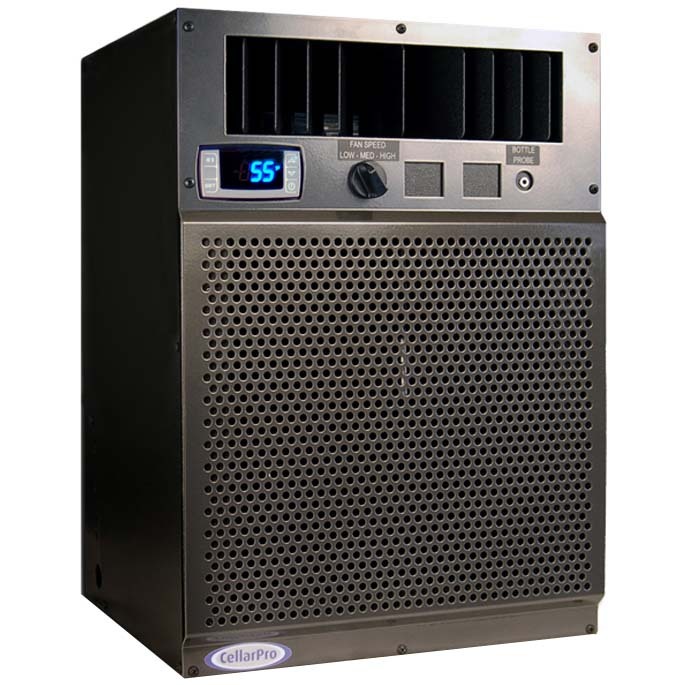 The CellarPro Mini-Split is rated for both internal and external applications. This 1/4 Ton Nominal Refrigeration System allows for quieter operation by separating the Evaporator Unit from the Condensing Unit. In addition this 1/4 Ton Nominal Refrigeration System eliminates the need for large holes in your cellar wall. The Evaporator Unit is designed to mount on the wall near the top of the Wine Cellar. Outside of the Wine Cellar, the Condensing Unit is attached to the Evaporator Unit by a Line-Set that can run up to 100 equivalent feet. The Line-Set is sold separately. The Evaporator Unit uses a variable-Speed Centrifugal Fan with three different settings including: (1) "High" - setting for maximum performance, and (2) "low" - for super-quiet operation. The Condensing Unit is designed to handls environments ranging from 0°F to 110°F. The Condensing Unit requires 12 inches of Unobsturcted Space in front of the coils, and requires 600-700 CFM of ventilation when installed in a confined space. This CellarPro Split Wine Cellar Refrigeration System offers a choice of wiring. The Condensing Unit can be either electronically controlled be and wired to the Evaporator (single power source on the Evaporator Side), orit can be controlled by a Solenoid Valve (dual power source, one each to the Evaporator and Condensing Unit). Please Note: the former choice (with Electronic Wiring) will allow the Condensing Unit to be used in temperatures down to -20°F. Comments: This is the 4th Cellar Pro system I have installed. They work great for BreezAire replacements because of the solenoid valve option. The hood cost is expensive, but other than that, a good value and a good look!